April offered old-time farmers a free treat that could warm their stomachs, brighten their rooms, and even line their pockets. 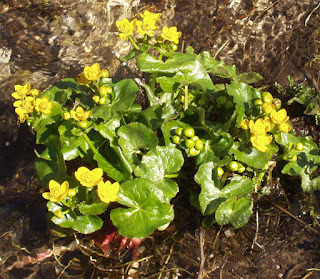 We call them marsh marigolds, but New Englanders knew them as cowslips. Their yellow flowers filled wetlands, offering the first big blooms of the season and a chance to decorate winter-weary homes. They were also popular as a spinach-like dish. William Hamilton Gibson wrote in 1880: “The eager farmer’s wife fills her basket with the succulent leaves she has been waiting for so long; for they’ll tell you in New England that ‘they ain’t noth’n’ like cowslips for a mess o’ greens.’” Being bitter like most buttercups, they had to be well-boiled first. That bitterness, incidentally, is protection from today’s voracious deer. There was gold in those yellow flowers, too. Enterprising farmers picked bunches of cowslips to send to nearby cities where boys would sell them on street corners to people eager for spring blossoms. The plant’s name sounds romantically agrarian, but isn’t quite. Cowslip, named for a European barnyard weed, is from the Old English, meaning “cow slop” – that is to say, cow crap.